Last day at the cottage ... kids are bickering in the water, bickering in the woods, bickering with each other, bickering with their parents, probably bickering with the fish too. I had a splitting headache, probably from all the bickering or something. Time for a diversion. The local state park. 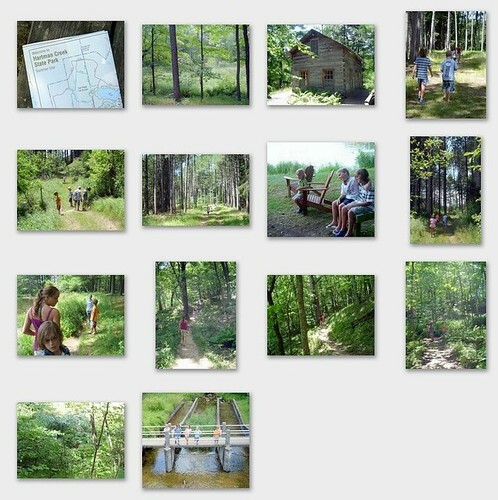 5-10 minutes from the cottage, but *new* to the kids. Ahhh... I took 6 of them with me (my 5 and 1 cousin) and it was awesome! As soon as we pulled in the kid found a beautiful 120 year old restored log cabin that had a few benches and a lecturn set up next to it. School was in session, C was the teacher and cousin S was principal. No arguing, no fussing, no disagreeing. It was bliss. I sat on a bench a bit away and watched a deer near a stream. After "class" we hiked around collecting flowers, looking at bugs and plants, and hoping to not get lost. I did not mention to the kids that the trail we were on was about 1 1/2 miles long ... funny how that didn't come up in conversation. It was a neat hike ... into and out of a few ravines and around a lake. At one point the kids stopped to rest and were able to watch a beautiful deer in the woods. She just stood there until we were done watching her and then went on her way. Not something we see every day! To refresh after hiking we found the parks beach. I saw it and cringed ... there was no way the kids would be happy there after everything the cottage had to offer, and everything we have at the beach here. But no, they loved it, bounded right in and played non-stop for as long as I let them. I have to laugh though because the "sand" was pretty much dirt, the water wasn't very deep at all and was super crowded, and they had nothing but each other to play with. We got back to the cottage renewed and refreshed, and full of stories to tell.